North America’s Western Cordillera, from Alaska to Southern Mexico, is a wall of mountain. Except for a low point called the Deming gap, between the Rocky Mountain’s end at the Mogollon Rim, and the Sierra Madre Occidental in Mexico. Chihuahua Desert grasslands spill west through the gap to mingle with cactus in the Sonora Desert. Both deserts span the area between Rockies and Sierra Madres, including southeast Arizona and northern Mexico. Puncturing the desert are mountains ten thousand feet high, where rainfall doubles, snow falls in winter, and alpine forests thrive. This confluence of temperate and tropic, grassland and cactus, dry desert and pine-capped mountain creates one of the most amazing places on the planet. It is the Madrean Archipelago. ‘Madrean’ is the floristic region’s name, derived from Sierra Madre. ‘Archipelago’ because forty distinct mountains poke through a sea of desert, each an environment of unique complexity. These are the Sky Islands of the Madrean Archipelago. Here’s ten amazing facts. Their names, Penaleño, Galieuro, Huachuca, Chiricahua, Santa Catalina, Rincon and Santa Rita evoke the Spanish influence on the region. They rise abruptly from the valley floor. Piles of granite extrusion, caverned limestone and volcanic flow – wrinkled, faulted, folded earth. Each is an ecology of it’s own, or more precisely, several. Drive Mount Lemmon Highway to the 9,157-foot summit of the Santa Catalina’s for a bio-tour from Mexico to Northern Canada – in just twenty-five miles. 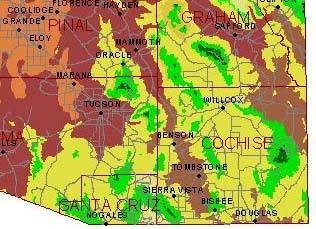 Leaving Tucson, you begin in creosote chaparral, typical of Sonora. It’s so dense with plants you wouldn’t think desert if there weren’t needles to remind you. Barrel cactus, prickly pear and cholla grow thick, and thermometers read triple digits the entire summer. A forest of Saguaro and occotillo blanket the slopes as you begin to climb. Within minutes, these yield to grasses, juniper, yucca and cooler breeze. It’s like Chihuahua. A few miles farther are pine-oak woodlands. Pine-oak woodlands cover every Sky Island in the Madrean Archipelago; they come from Mexico’s Sierra Madre. Above seven thousand feet are forests of ponderosa pine, denizens of the Colorado Plateau that marched down the Continental Divide. On the tallest sky islands are glades of fern, forests of aspen, spruce and fir, and temperatures thirty degrees cooler than the desert below – just like Canada. Steeply gorged canyons collect snowmelt and rain into riparian ecosystems. Sycamore, willow and cottonwood fill the lower reaches, and streams tumble down cataracts to pool in box canyons, creating enchanting microclimates. One can experience eight of the worlds twelve bioregions in a single day’s hike, and walk past a thousand different plants. This vertical variety of ecosystems is compared to the Galapagos Islands for its diversity. The Most Critters In The U.S.
Twice as many mammal species than Yellowstone Park inhabit the region – 104 at last count. From common black bear to boar-like javalina, black-tailed prairie dog to tropical coati mundi, the region is one of the most diverse in the world. There are 29 species of bat, alone. The International Union for Conservation of Nature (IUCN) recognizes the Sierra Madre and Madrean Archipelago as one of three biological “mega diversity” centers on the planet. Many species are threatened. One hundred and fifty-three are listed as vulnerable. Man eradicated grizzly bear, but Mexican grey wolf, reintroduced decades ago has returned to some Sky Islands. Bighorn sheep have also been reintroduced to replace lost herds. 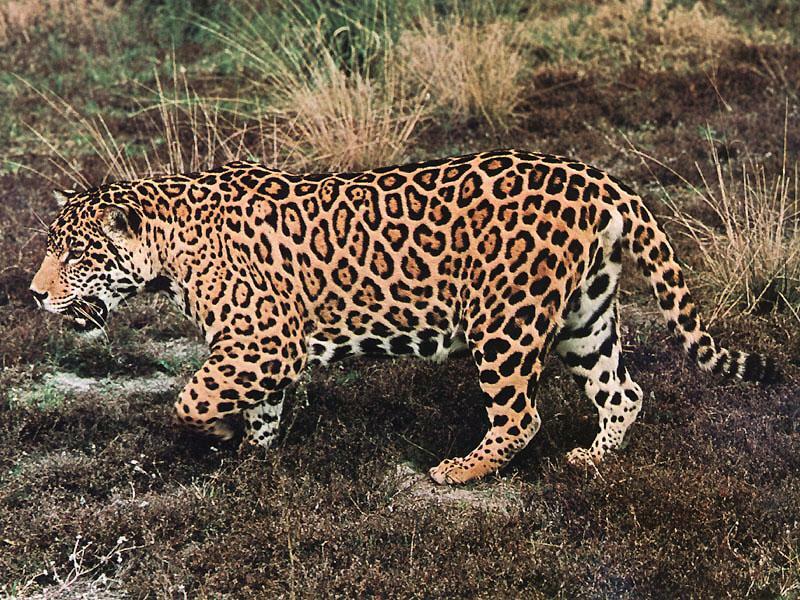 In 2013, a jaguar, largest cat of the America’s, and third largest of the worlds big cats, was photographed in Arizona’s Santa Rita’s. 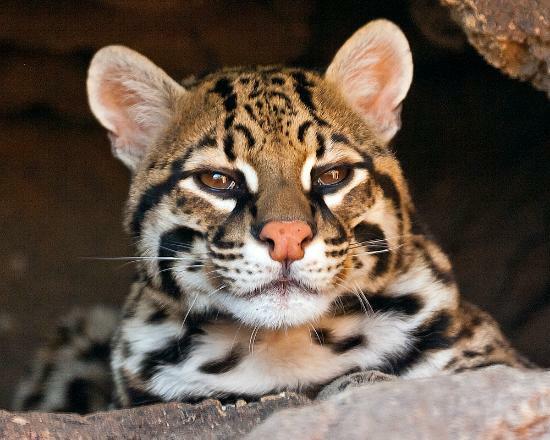 Ocelots have been photographed in Arizona, too. Both cats retreated far into Mexico, it was thought. These have come back, or perhaps they never left. Which raises a significant issue with a border fence. Many Sky Islands are in Mexico. The greatest diversity of creatures on the continent migrate hopscotch between them, and the border cuts their path. It is a significant issue in debate about the border to ensure protection of their migratory routes. The critters can’t apply for visas. There are places on every birder’s bucket list. 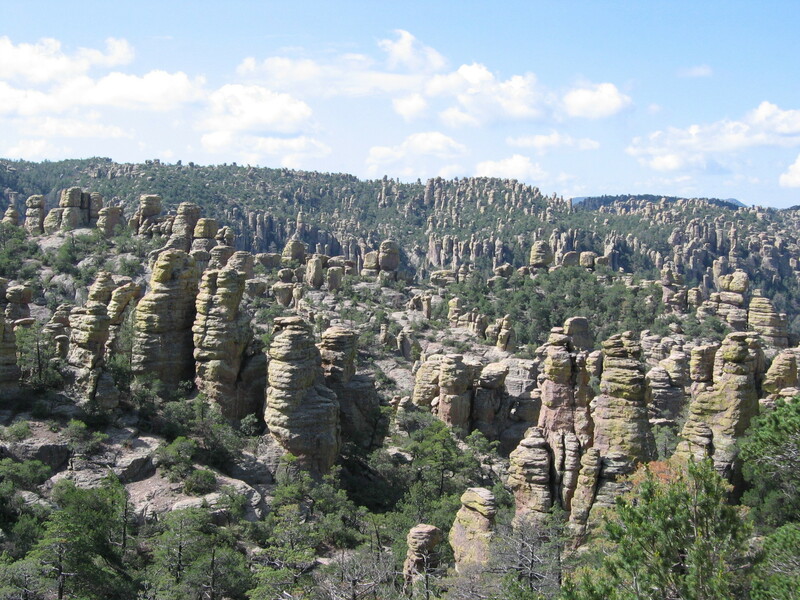 The Chiricahua Mountains are at the top, because half of all avian species in North America are found there. The San Pedro River flows north from Mexico, to join the Gila. It is the most significant free flowing stream in the southwest. Flanked by the Dragoon’s and Chiricahua’s on the east, and the Huachuca’s on the west, it forms a corridor birds fly in migration, which makes the Dragoons, Huachuca’s, Chiricahuas, and the valleys between, their home every year. Miller, Carr and Ramsey Canyons in the Huachuca’s. Thirteen species of Hummingbird are documented every year inRamsey Canyon. Birders can witness the Elegant Tanager, Eared Quetzal, Rufus-capped Warbler, Aztec Thrush, Brown-backed Solitaire, and others rarely, if ever seen elsewhere in the U.S.
Cave Creek Canyon in the Chiricahuas is famous the world over. Of special interest are wintering raptors. It is not uncommon to check 100 birds of prey off your list in a day, including the rare Ferruginous Hawk, Northern Harrier, Harris’s Hawk, Prairie Falcon, Bald Eagle, Golden Eagle, and Red-tailed Hawk. The San Pedro Riparian National Conservation Area, managed by the Bureau of Land Management, is a 56,000-acre preserve along the upper San Pedro River. An estimated 4 million migrating birds travel there each year. It is home to over 100 indigenous species, including forty percent of all Gray Hawks in the U.S. The area has the most reptiles, bees and ant species in the U.S. 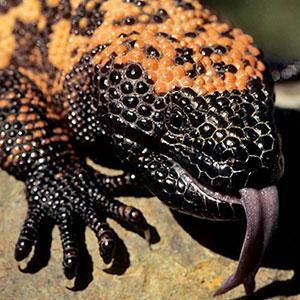 There are 135 types of snake, lizard, toad, and turtle living there. 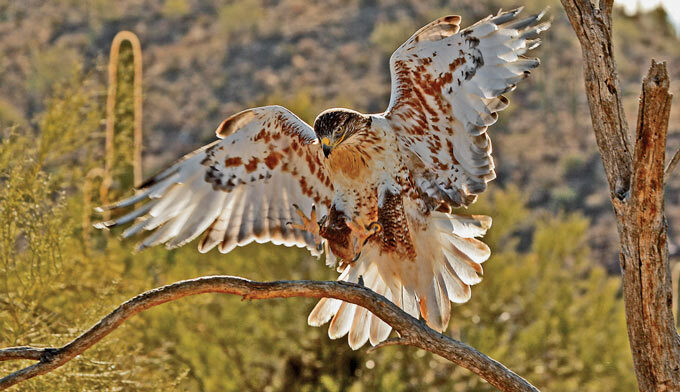 The finest place to see and learn about the diversity and splendor of plants, reptiles, birds, mammals and insects that inhabit the region, is the Arizona Sonora Desert Museum. 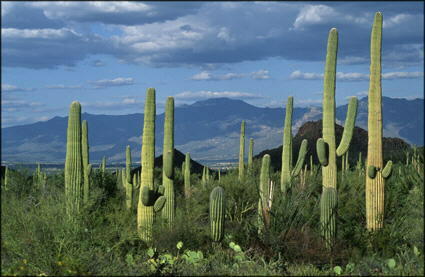 It’s located in the natural desert environment, next to Saguaro National Park, west of Tucson. It’s ranked one of the Top 10 Museums in the country by TripAdvisor.com and contains 98 acres of zoo, aquarium, aviary, botanical garden, art gallery, mineral exhibit, and natural history museum. It’s not just plants and animals that define Madrean diversity; it’s the rocks too. The Sky Islands exhibit more mixed geological composition than any other place on the planet. Formed 13 million years ago from continental rifting, the mountains did not rise so much as the valleys sank away, leaving the hard rock standing. 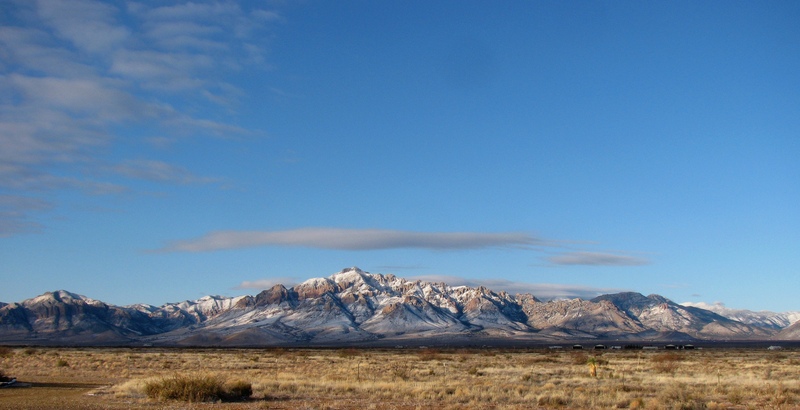 The Chiricahua Range is a single massive volcano, whereas the Santa Catalina’s, Rincon’s, Penaleño’s and Dragoon’s have metamorphic cores of gneiss and granite. The other Sky islands are predominately limestone. This mixed composition presents a variety of soils types, which contributes to the wide diversity in plants. No wonder Tucson is home to the largest Gem and Mineral convention in the world, with over forty show arenas throughout town, anchored by the prestigious Tucson Gem and Mineral Show held each year in February. Its Where The Anasazi Disappeared. The region is a crossroads for people as well as flora and fauna. It is the scene of one of the greatest mysteries of antiquity – the Anasazi, who left castles and cliff dwellings, roads, farms and kivas in the Four Corners area in apparent hurry in 1,300 A.D.
We may not know why they left, but we know where they went. They came here. The Anasazi were only one group of Pueblo Indian. Puebloan culture extended from southern Utah and Colorado, throughout Arizona, New Mexico and Mexico. Cultural cousins to the Anasazi were the Mogollon, Salado, Paquime, Hohokam and other Puebloan people. When the Anasazi departed Mesa Verde, Kayenta, Canyon de Chelly and other Four Corners pueblos, they fled south and joined these groups. Some followed the Rio Grande, or joined clans on the Mogollon Rim. Others passed through and found a home in Paquime, in Mexico. But many came to reside with the Hohokam, who lived along the rich riparian canyons of Sky Islands, and built sophisticated catchments and irrigation canals to water their crops. The San Pedro River Valley was a causeway for trade and travel to the Pueblo Indians, who traded with the Aztec. Artifacts spanning centuries from Chaco Canyon to Kayenta include Macaw feathers, obsidian mirrors and hammered copper that came from Aztec culture deep in Mexico. When the Spanish arrived, they took the same trail. In 1540, Francisco Vasquez de Coronado and his conquistadors entered what is now the United States in the San Pedro Valley, near the Huachuca Mountains. They traveled north in search of “seven cities of gold” and found one hundred Indian pueblos, the Grand Canyon and Kansas before giving up on gold. Today, several Sky Islands compose the Coronado National Forest. Before Spaniards arrived, Eskimo’s came to the Sky Islands. Navajo and Apache are of Athabascan origin. They migrated from Canada, like the spruce and fir that populate the mountains, and are genetically linked to today’s Eskimo. Bands collectively known as the Chiricahua Apache made the Sky Islands home, and fought 150 years of war to stay there. The most seminal event of the Apache Wars occurred when Mexicans killed the wife and children of a man named Goyathlay. Today we call him Geronimo. The crime fostered his vicious guerilla approach to warfare that had Mexican and American soldiers scouring the entire region. The complexity of the geography aided Geronimo, making his renegade band impossible to find. General Nelson Miles, who captured Geronimo in 1886, built a heliograph station in the Penaleño Mountains to signal troops in search of the Apache. The place is still called Heliograph Peak. At one time, 5,000 troops hunted Geronimo and his band of a few dozen warriors. Geronimo lobbied to the end of his life to allow his people to return to the Chiricahuas. President Theodore Roosevelt denied him, saying it would raise fear in the “local” people. Today, Sky Islands are home to more peaceful pursuits. There are twenty-five active observatories located on their peaks. Clear, dry desert air, low light pollution and peaks that reach seven to eleven thousand feet above sea level make this place tops for astronomers. That’s why the University of Arizona in Tucson is a renowned institution for optics and astronomy. The Santa Catalina Mountains, north of Tucson are home for the Mount Lemmon Observatory, and the Mount Lemmon Sky Center, affiliated with the University. South of Tucson, in the Santa Rita Mountains is 8,550-foot Mt. Hopkins and the Fred Lawrence Whipple Observatory, operated by the Smithsonian Astrophysical Observatory. Above the town of Safford brood the Penaleño range, tallest of the Sky Islands, where several observatories reside atop 10,720-foot Mt. Graham, including the Vatican Advanced Technology Telescope, the Large Binocular Telescope and the Mount Graham International Observatory. 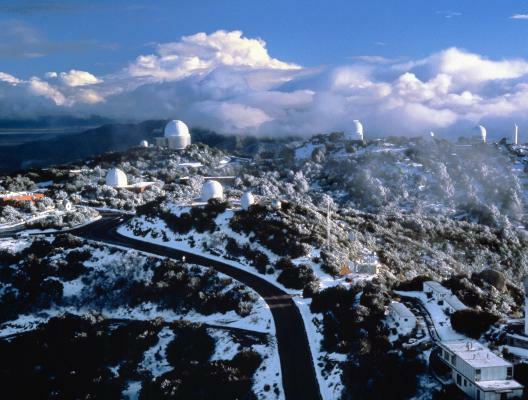 Most famous of all, and the largest collection of optical telescopes in the world, is Kitt Peak National Observatory, at 6,875 feet in the Quinlan Mountains southwest of Tucson. These connect the Sky Islands with researchers around the world, bringing the entire universe into focus, making it the greatest crossroads on the planet. Researchers say data from IceCube Neutrino Observatory at the South Pole indicate cosmic rays zapping Earth at the South Pole are coming from particular locations, rather than distributed uniformly across the sky. Stefan Westerhoff of the University of Wisconsin and team used the observatory, buried under a thick layer of ice, to create a comprehensive map of the direction of cosmic rays in southern skies. The device detects elementary particles such as muons and neutrinos. 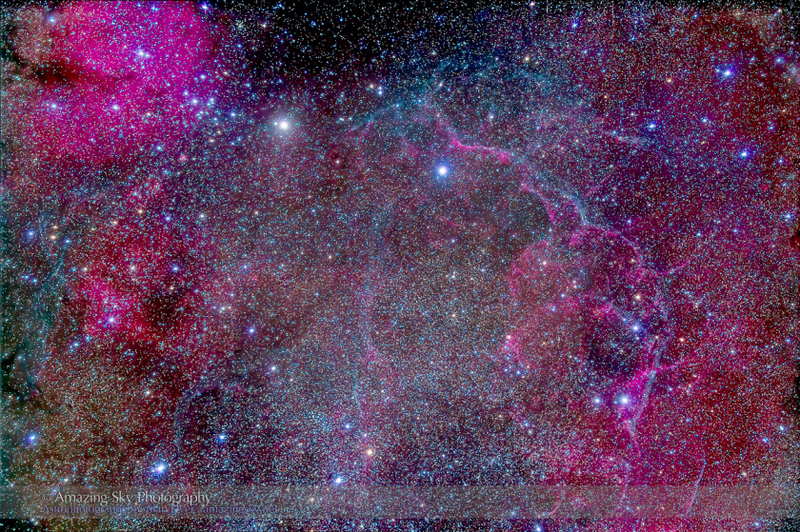 The cosmic ray source is 800 to 1,000 light years from Earth in the Vela supernova remnant. The massive star that formed this structure blew up between 11,000 and 12,300 years ago, astronomers believe. Astronomers also believe Vela left at its core a pulsar-class neutron star, which has the density of an atomic nucleus spinning on its axis 10 times per second. I would argue with that, EU provides more plausible explanations, but that is not the point, except to recognize estimates of when Vela occurred are based on those assumptions. 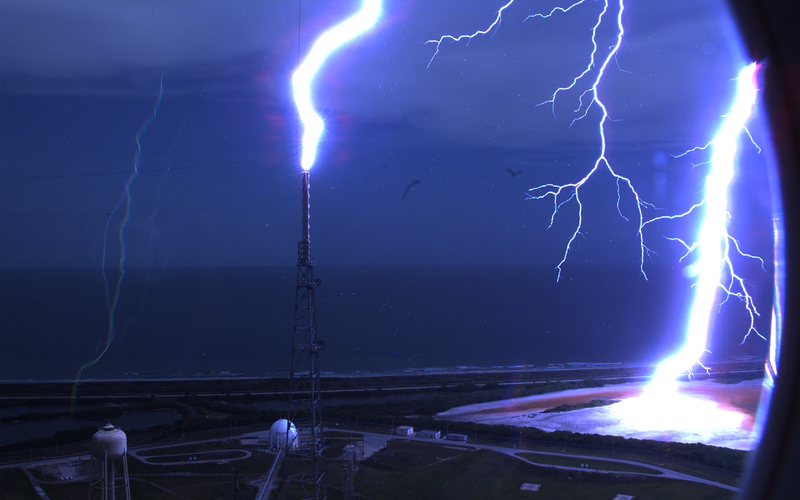 Astronomers also believe cosmic rays from such distance are buffeted by magnetic fields, lose all direction and should appear evenly from all parts of the sky. That’s not what they observed. Felix Aharonian of the Dublin Institute for Advanced Studies in Ireland and colleagues suggested a “tube of magnetic field lines” between the source and our solar system, a funnel of cosmic rays. Aharonian scoffs the theory is highly speculative. No it isn’t. What’s crazy is Felix sees an expected EU phenomena and doesn’t get it. Vela may be 800 light years away, but it’s in our galactic neighborhood. By “tube of magnetic field lines,” Aharonian means a Berkeland current. He doesn’t use the proper terminology lest he give credence to a theory that actually explains what’s being seen. I discovered Electric Universe because of interest in events that occurred at the end of the last ice age. Around 10,900 BC, as the earth slowly warmed from the last glacial period, the climate suddenly reversed. 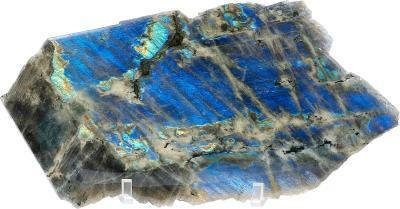 Glaciers expanded and the Earth suffered a relapse into deep freeze, killing most megafauna. Then, in 9,700 BC, the cold stopped and Earth warmed – very suddenly. The 1,200-year period is called the Younger Dryas (YD) after the arctic flower that bloomed effusively, spreading pollen throughout the thick, dusty, wind-blown sediments of the period. Substantial evidence indicates YD was caused by comet or asteroid impact on the North American ice sheet. Tell-tale nano-diamonds at the boundary marking YD sediments heavily support this. 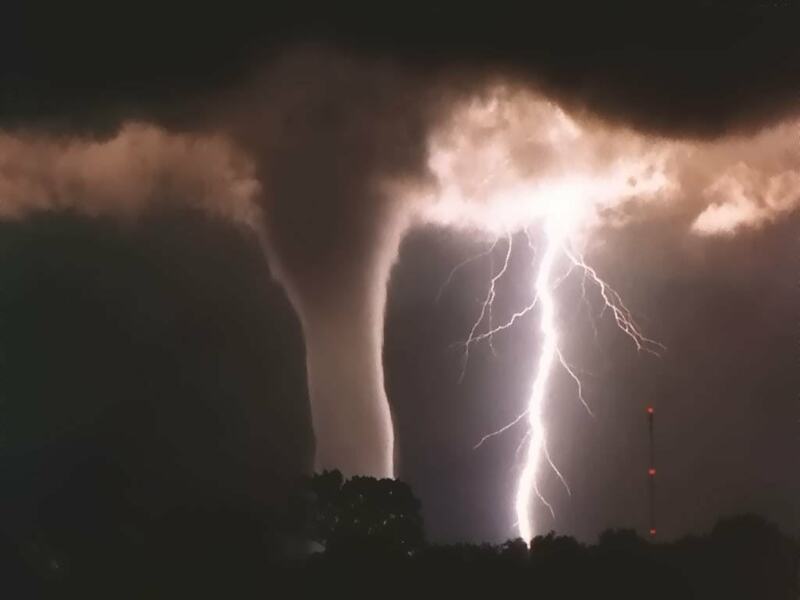 Climate change was rapid, but occurred over centuries, also consistent with impact theory. The end of the cold is a bigger mystery. Evidence shows it occurred in less than three years – and perhaps it happened all in one, very bad day. I have a notion Vela was involved. Item 1 – Dr. Anthony Peratt identifies prehistoric petroglyphs with extreme aurora events. This is a significant clue to the past. It’s also a clue to the workings of our solar system. Peratt’s work is clear. A gigaampere event lit up the southern sky with amazing aurora seen worldwide and recorded in stone. Item 2 – Dr. Heinrich Svensmark theorizes a high energy cosmic ray connection to cloud formation and correlates ice ages with the position of the solar system within the galactic plane, causing increase in cosmic rays due to EU recognized phenomena. He has previously proven a connection for cosmic ray-ion-cloud formation in cloud chambers. 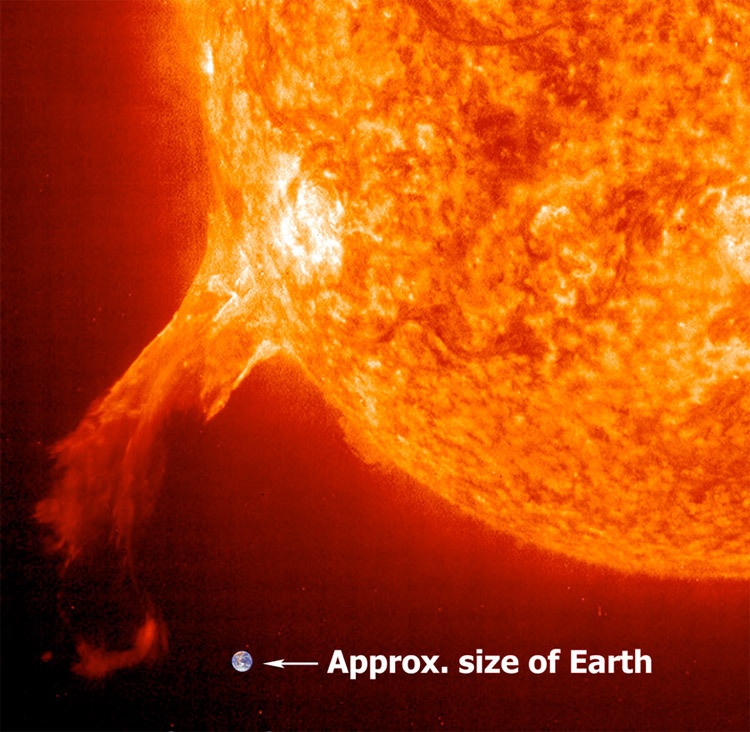 Item 3 – Dr. Robert Schoch theorizes a significantly large CME, or solar flare may have caused the YD climate change consistent with EU theory. He has previously shown erosion of the Sphinx makes it thousands of years older than thought, and perhaps dates to the YD period. Item 4 – Vela theoretically went supernova in the period of the YD, although dating is based on neutron star theory, which EU does not support. The dating is based on frequency of the pulsar. EU theory predicts pulsars to be the flickering remains of a massive z-pinch short-circuit, presumably ending the life of a star, not a neutron star rotating ten times per second. Item 5 – Vela is still blasting us with cosmic rays through Birkeland filaments in the Milky Way, as discussed in the opening. If that connection were open when the event occurred, the highest energy light-speed particles, gamma and x-ray would hit the heliosphere through a focused channel, not diffuse in space. EU predicts these currents exist between stars in the galaxies and between galaxies in the Universe. It suggests they are not randomly connected, but linked electromagnetically. The sun would necessarily respond to the extra energy. 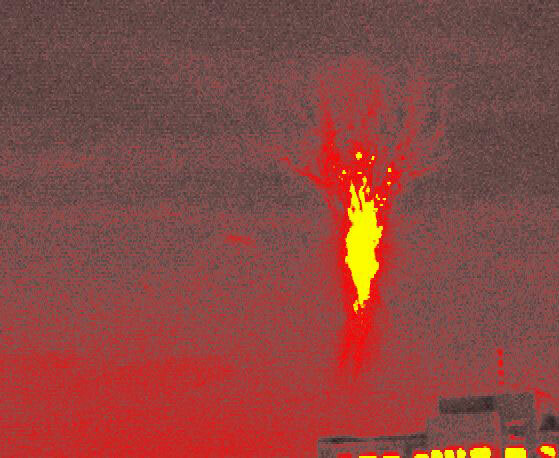 This provides a mechanism for Dr. Schoch’s CME, or flare event. This may be weak correlation, but there is a beautiful framework of EU phenomena we have observable evidence to study. Let’s see if we can strengthen the correlation. Petroglyphs are hard to date. Their age can only be inferred from the age of artifacts found in association. Weathering, patina, lichen growth are only comparative measures…it’s never certain. Furthermore, plasma events may have occurred many times in pre-history, and the rock art may record several events. Hopefully, evidence will emerge. Nevertheless, there is one point in time when it may be possible to correlate. Item 6 – An article in Journal of Archaeological Science, by paleo-climatologist Larry Benson dates Nevada petroglyphs from radio carbon dating coatings on the rock. His study indicates they were made between wet periods when the rocks were submerged, which he correlates with age of strata in the lakebed to have occurred between 8,000 and 12,800 BC. 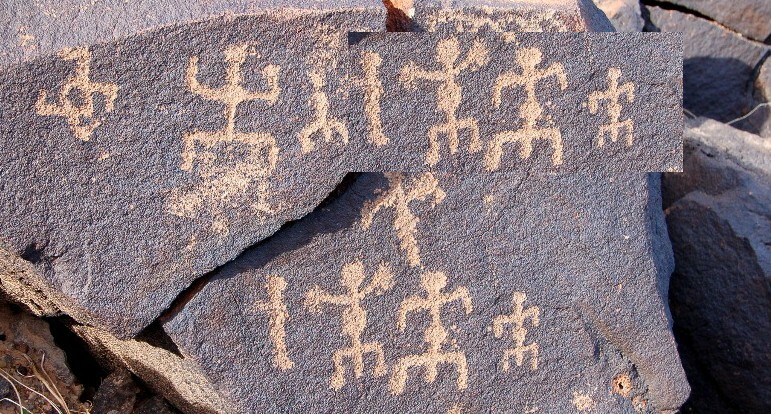 Pictures on his website clearly show the petroglyphs portray plasma instabilities, including everyone’s favorite “squatter man.” The researcher claims it to be the oldest dated glyph in North America. Item 7 – At Lapa do Santo, Brazil archeologists uncovered a petroglyph in undisturbed strata. By radio carbon dating material and other confirming test in the strata they determined the glyphs age to be 8,000 to 10,000 BC. The glyph depicts a Peratt instability of the “squatter man” variety. Researchers claim it to be the oldest dated glyph in South America. 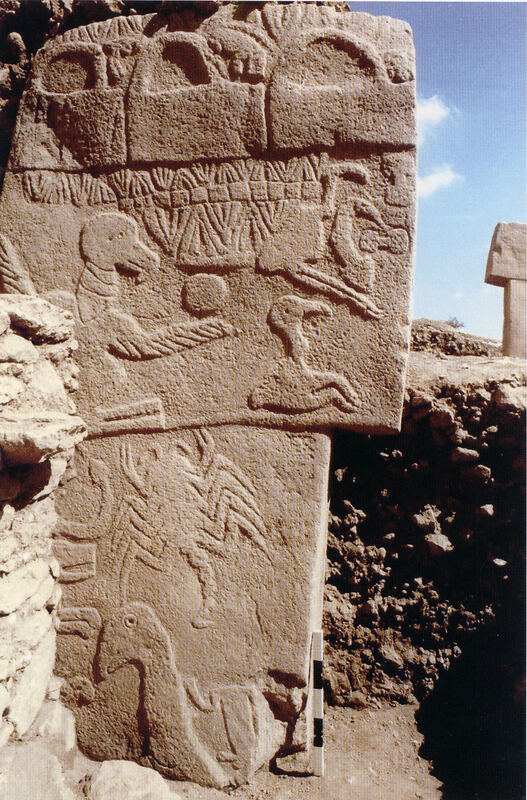 Item 8 – Gobleki Tepi, Turkey is the worlds oldest megalithic structure firmly dated. It was manually covered with dirt and remained that way for thousands of years. Its beginning of construction is dated to roughly 10,000 BC. The exquisitely sculpted columns depict a variety of animal forms. Some of these, if not all, are slightly morphed characterizations of plasma displays artistically portrayed as birds, beaver pelts, geometries and other figures. 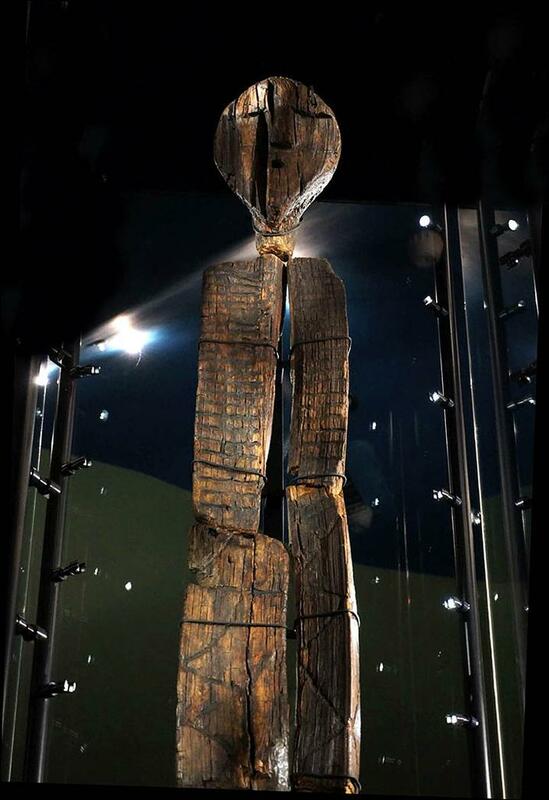 Item 9 – The Shigir Idol, a very well-preserved carved wooden totem found in a peat bog in the Urals is the oldest wooden statue in the world. Meticulous dating indicates it was constructed circa, 9,000 BC. 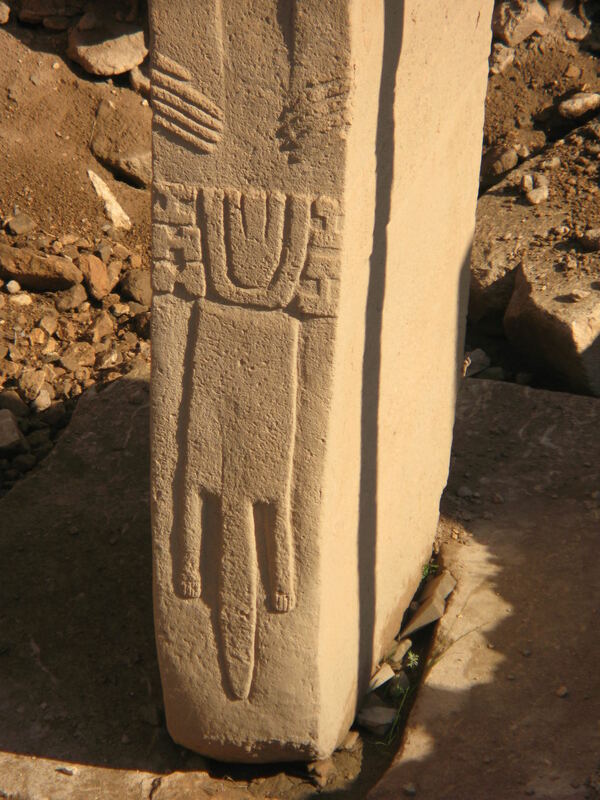 It’s carvings depict the same grids, wavy lines, stacked diamonds, snakes and other images typical of the Peratt instability class of petroglyphs. Artifact dates are within a common set between 9,000 and 10,000 BC. Vela is dated to 9,000 to 10,300 BC. The YD warmed in 9,700 BC. They are smack-dab in the same ballpark. I rest my case. It’s the best I have at the moment. EU predicts the possibility, science backs-up the dates, and I think it is an opportunity to learn more following this train of thought. Just consider, these petroglyph images are a million in number on every continent except Antarctica. If one particular year, decade, or century can be identified when the events occurred, we have a global survey of the people and where they were and what they witnessed at the time. That would lead to better interpretation of every other bit of pot sherd and bone discovered, every snippet of myth and spiritual belief. 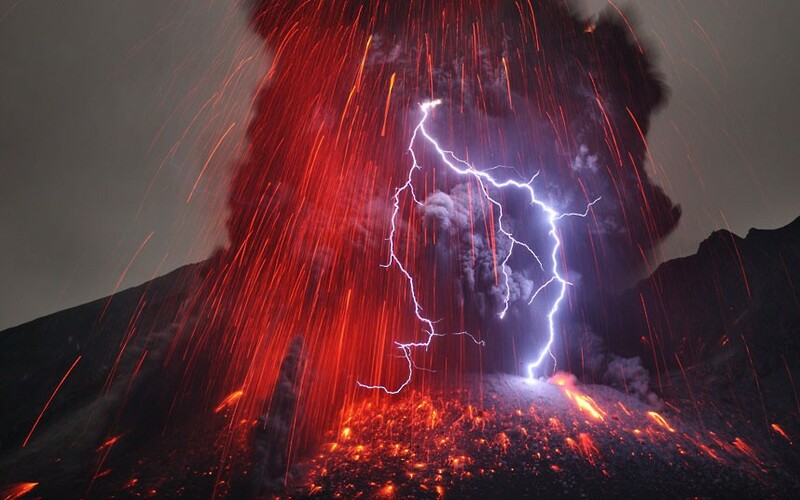 Whether Vela was the cause, whether that resulted in a solar flare, or a direct cosmic bombardment of Earth, or both, I think we have an event recorded from 9,700 BC that caused the Earth to warm rapidly, glaciers to melt in torrential floods and storms unlike any seen since. Many legends and myths around the world also support this. The Kachinas in the sky must have frightened ancient man to the core. Were those who pecked the images they saw in the southern sky into rock survivors, or were they the ones trying to worship the aurora while lucky individuals sat under the rocks. There is more evidence out there. Mainstream archeology seems to be deaf to the science of Peratt’s work. If you glanced at any of the links you’ll see that outside of the EU/Plasma community it is not mentioned. 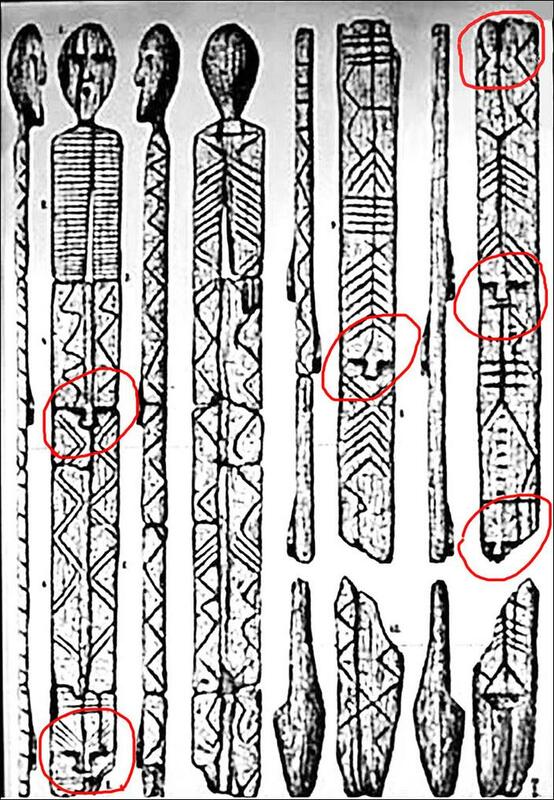 It’s over a decade since Peratt’s paper published and archeologists are still interpreting these figures with blinders on – as regional culture based phenomena, without seeming to know, or acknowledge these are found around the world. They continue to blunder on, interpreting them as cultural icons on which they base absurd migratory assumptions, shamanistic psychotropic visions seen across a shared human consciousness, or proto-language script. Well, it is the latter if you consider rock panels as catalogs of things witnessed, which is how I see it. I believe they witnessed and recorded on rock as they watched, and reproduced the images, applying they’re own interpretations as art at Gobleki Tepi, on the Shigir Idol and as we still do today. These images are on petroglyphs, intaglios and artifacts in every part of the world except Antarctica. There are more examples that can yield dates out there, and the information may already be in someone’s knowledge. If you know of anything, please e-mail, or leave a comment. I am interested in any information that can lead to dating an artifact, petroglyph, pictograph or intaglio that depicts Peratt instability imagery. And by the way, has anyone checked on the status of Betelgeuse lately? If you have read this entire post but have not read Dr. Peratt’s paper, it is at this link. If you don’t know about EU, follow Electric Universe. 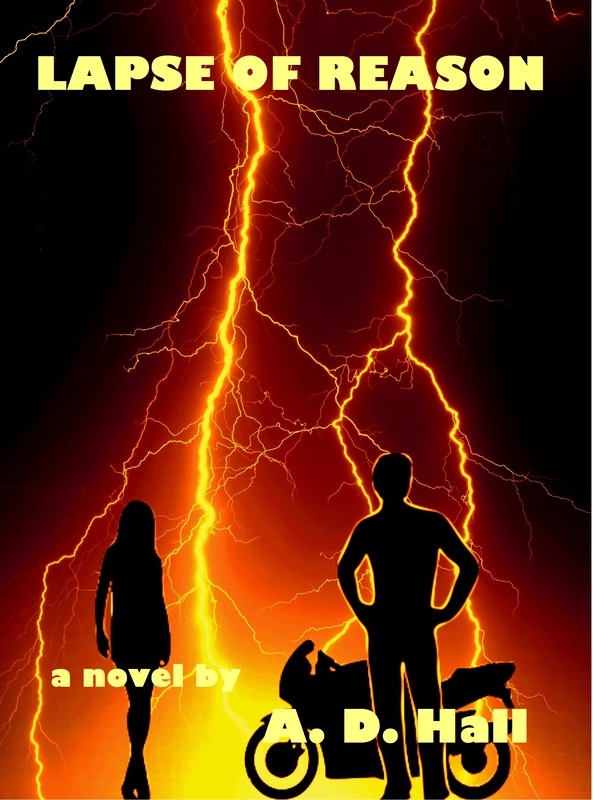 Read my Thunderblogs.